Party and Join at a Discount! Wanting to try Pink Zebra and thinking about possibly becoming a consultant? We're doing an awesome host and join special where you can see first hand what it's like to host a Pink Zebra party! I'll help you every step of the way and not only can you earn half-price and free items, you can also join as a consultant for a discounted price! Peace Begins with a Dream! Join Pink Zebra on January 25th for $49.50! Join Pink Zebra on January 25th for just $49.50! Hurry as it is only valid for the first 1,500 enrollees! Sign up here: http://www.pinkzebrahome.com/smellsprinkles/join.asp. Pink Zebra Black Friday Kit! 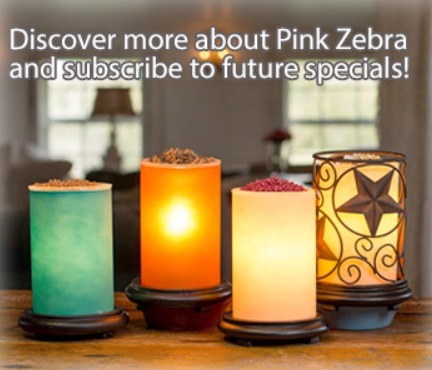 Pink Zebra is celebrating their 5 year anniversary with a special candle set! This includes a white etched-glass candle with a silver plate that has our motto, "Change Your Fragrance, Change Lives" across the front! This set also includes 3 wicks and a FREE 16 ounce carton of Champagne Mimosa Sprinkles! Are you excited about 2016's upcoming election? Show your support by purchasing Democratic or Republican candles for $12 and receive an exclusive Pink Zebra jar of American Pie sprinkles! This election candle set is only available until July 28th or until they sell out! Buy the new Lone Star Shade and get a FREE jar of Toasted Marshmallow Sprinkles! Simply purchase the shade and your Sprinkles will be automatically added! Not valid on any Host Rewards. Order must be completed by 11:59 PM EST on January 8,2016. While supplies last!